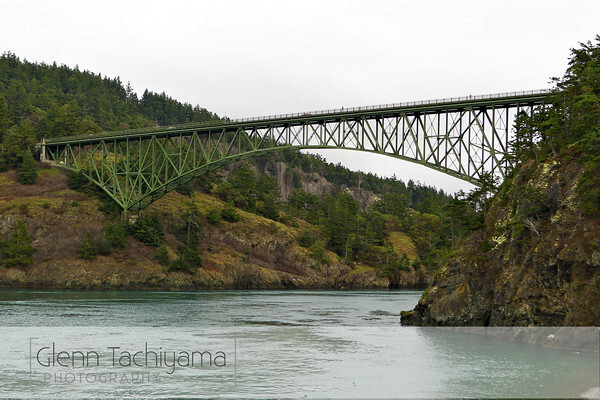 The Vancouver+Seattle crew and I looked forward to this relaxing weekend in Deception Pass for quite some time. 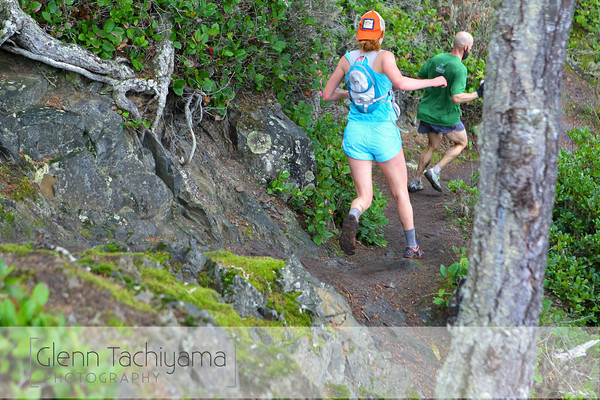 Sure, we were running Rainshadow Running’s 50km on Sunday, but for us that’s synonymous with good friends, good food, beautiful trails, and fun– and what could be more relaxing? After a great day of meeting friends new & old and hydrating like a true wino, I go to bed wearing my runsie, race-ready. Getting dressed is always a challenge in the morning, I think. It’s the morning of the race and I’m up at five, super keen to continue working on my creative project. (A pecha kucha on “fun” and goals.) Ah, dawn… this is when I feel most creative. People start to wake up and wonder where I am in the house, and that’s when I make my way to the breakfast area. Instinctively, I dump maple syrup all over the oatmeal I obtain from the rental house cupboard. But the oatmeal is not tasting sweet this morning, it’s tasting oily / sesame-y. I take a few bites thinking I will force myself to down it anyway, then I momentarily regain self-respect and decide that wasting in this case, is the least harmful option for all involved. I toss the oily oats with confidence. Take two. Alicia, where are you?! Call Meghan and Tara. (I’m off in a corner, working creatively again.) But it’s time to put the project down for now, despite the creative frequency I’m experiencing. 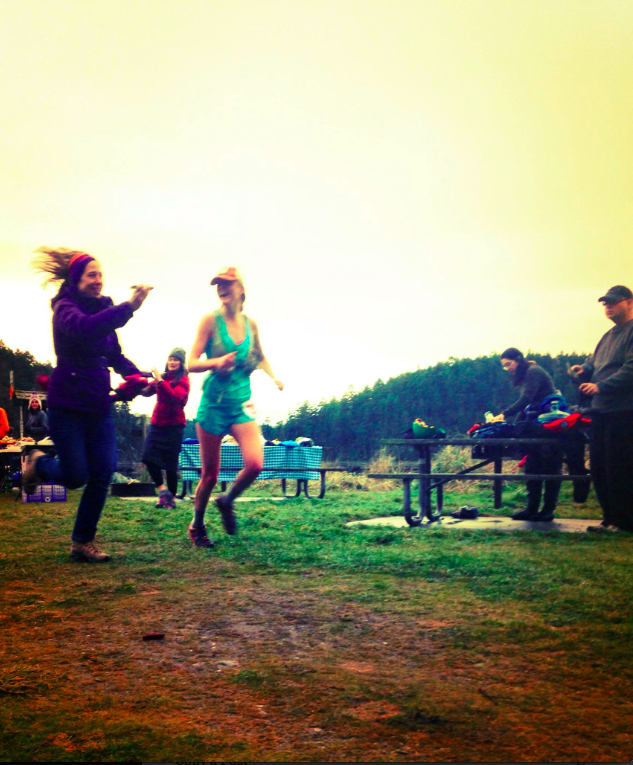 It’s time to turn off my brain and run– athletic playtime. Just as daylight breaks the race begins and a bunch of guys shoot out like it’s a road marathon. I follow in not too far behind like I know what I’m doing. I was curious. 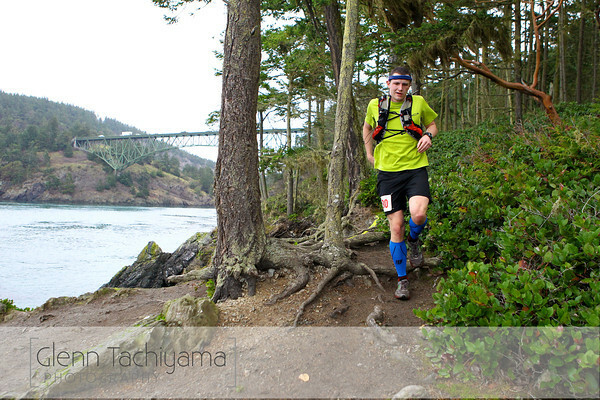 Before this race, I had traded formal, structured “training” for simple, fun trail runs everyday to work, and I’m really curious to see how I will fare today on my new “lifestyle” approach to trail running. My hypothesis is that I will do better with this format, and deep down, I’m motivated to validate this new approach today. Barry is ahead of me and it gives me a reassuring reference point (good, I’m not going too fast!). But before long I am on his heels, which feels weird. Barry is always way ahead, so what was I doing getting so close to him? Next thing I know he’s encouraging me to pass him, and go find his friend John up ahead the snakey trail. Okay, I’ll take the lead for a bit, I think, and tell Barry I will surely see him later. I keep prancing along, loving the rolling, mildly technical single-track, which is sort of what I’m built for. 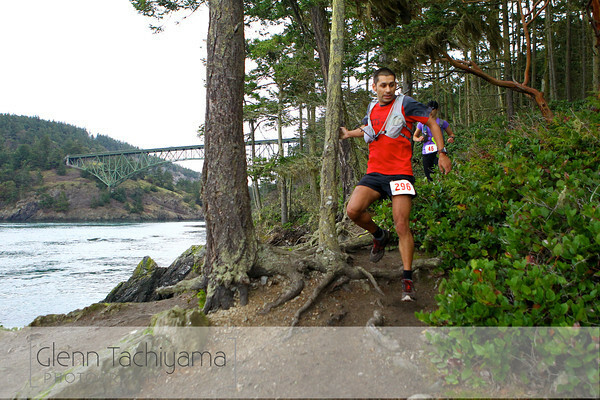 (I grew up running this sort of trail alongside my dad’s mountain bike on Burnaby Mountain, in British Columbia.) I am running along and having a blast. 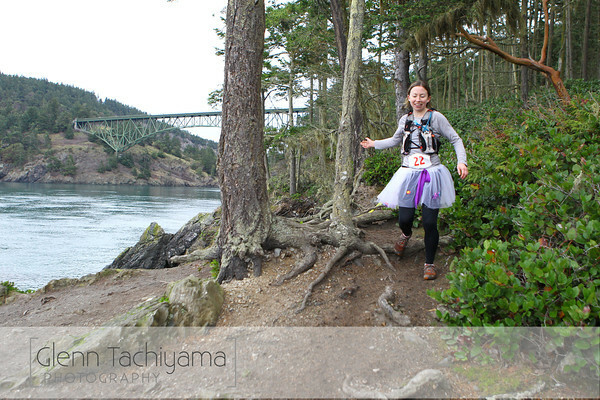 Angel and Tim give me personalized cheering at aid stations, Aggie plays the obvious choice– Eye of the Tiger, and Dave follows my every step on the bridge with his camera for the race video. (Yikes in advance.) After a while my friend Elliot catches up and joins along, which is comforting coupled with the fact that I’m realizing Elliot’s a liar– he had confided in me that he was so not ready for this race, he almost didn’t start. Ya, right Elliot. Not buying it. Half-calf socks. So hot right now. A little while later, I’ve finished about 1/3 of the race and I start to question whether I’ve gone out too hard. I don’t believe in wearing a watch, and one implication of this is you have no idea about “pacing”. You just go. I’ve never run this course, I’ve never really tried running an ultra as fast as I can before this, and I’ve come here off of an experimental new approach to training, with no recorded runs, no tempos, and no intervals except being late for work on frequent occasion. So basically, every variable is uncertain. The only thing I know is how I feel in the present moment, and whether my Bud hat is on backwards or forwards. (Right now, backwards.) I’m feeling good, but I’m not feeling unlimited anymore. I encounter the first relatively hard climb in this run, which is leading us up to a place called Goose Point. I hope it’s nice. As my legs burn up this hill I’m starting to regret going out so intensely with the top 10 or 15 boys. Just as I begin this sense of hesitation, a woman comes whizzing by and up ahead out of nowhere it seems, she’s so quiet. 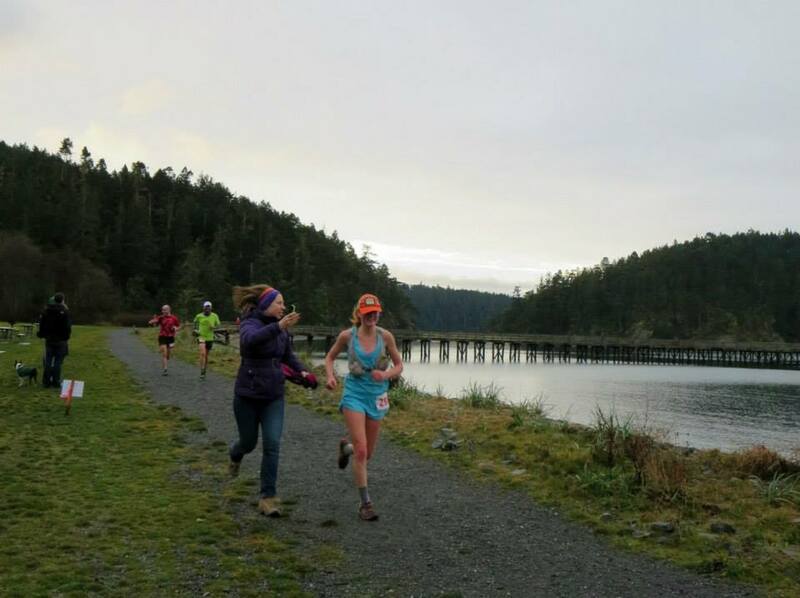 She’s running by at such a fast, effortless clip that I wonder if she’s even in the race? Maybe she’s some random girl out for a short, fast training run. I reassure myself. But I know better. When I loop back to the aid station, “2nd place woman!” confirms my suspicion that yes, this fast chick is indeed part of the 50km race. 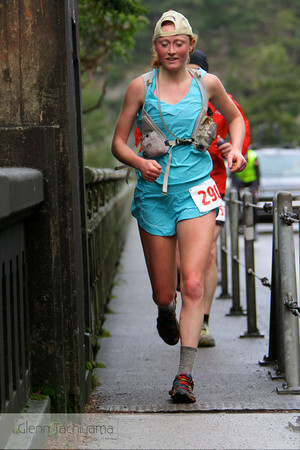 (I meet her after the race, and she’s fellow Canuck Stacey Carrigan.) Ah, well, I think. To salvage my mental state I dig deep to think in terms of teamwork, instead competition, and like usual, my mindset alters with it. Sweet… she can go ahead for us and better the women’s placement! I think. Go! It was like we were the women’s side, and we just got a substitute with fresh legs in the game. We needed a boost! I think. Angel is asking me all about my favourite beer. Whistler Chestnut, obviously! I feel great and open up my stride, running blissfully. This is when I start to feel effortless again, and I re-catch sets of men who were ahead of me earlier in the race. There’s a tiny climb and as I power-hike on the second loop, I hear a cheer from behind, it’s Barry urging me on ahead. I’m not really sure what it means, if it means that I’m close to my female counterpart, but it feels hugely supportive, so I just take the energy and run. As it turns out, the carefreeness really works for me, because apparently I speed up when I’m relaxed. I hit the final aid station again and just keep gunning down the road. This is exactly the point that my thoughts start to disconnect with my body. I discover that it’s 3 miles left, and even though that still seems far to kick, my body goes into a really strange mode I’ve maybe never experienced before. I’m running down the road like it’s a 3k race, pretty much possessed. Some guys beside me tell me, Hey! There’s the 1st place female! I shrug them off, this check is looking strong and she’s still 100 meters away, and hey, 2nd is great, right? But somehow, my body is drumming to a different beat, rejecting all of the mental compromise, and I’m running down the road like the possessed, track-loving road marathoner that lurks inside. Is this actually coming down to a road race?! And deep, deep inside, unconsciously the wheels turn, I’ve made a challenge and subsequently accepted. It’s the perfect scenario to validate my new non- training. Right after entering the lead, the final singletrack! On the road, my legs find a mind of their own and close down the gap from 100 meters, to about 40. We arrive at the final stretch of trail, and I’m not sure if I will catch her. It’s still a good gap between us and my insides are starting to feel gross, I’m entering the anaerobic hell mode I so resist encountering. Then, in the double-track trail there’s a pretty good short hill and my body finds this crazy down-shift, powering me up to an extent I’ve never experienced before. It’s dangerous because I have no idea how much trail is left exactly, but my body does it without thought.Despite the pain, I’m finding a way to go faster than ever, and next thing I know I’m passing beside her, to my own surprise probably even more than hers. I’m not sure what to expect as I come, but she congratulates me and says, great kick! Shortly after we enter the final single-track with me in the lead, and I feel a bit safer. With all due respect to my mind, the mindless approach in just letting my body go created this amazing, unrealistic result, beyond anything I could plan reasonably. I finish to high-five Elliot and to my surprise, discover I’ve set a female course record out there. That’s news to me! Barry comes in soon after and brings us some yummy beers the instant he finishes, and soon after come my lead female teammate Stacey Carrigan, my buddy Meghan, and a while after, a went-out-too-fast, tutu-clad Tara. 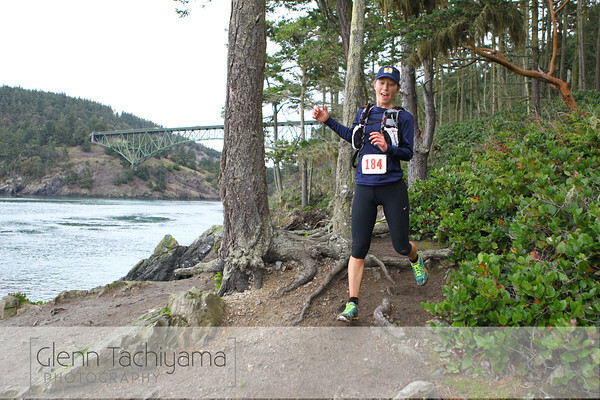 The one thing that was not a surprise on this day, was the fun race and post-race festival created again by Rainshadow Running. Yummy beers, freshly made pizza, live folk music, and all with inspiring, delightful people I’m proud to call friends. It was an amazing weekend that I’d love to share again in 2014. Let’s all go back next year and take down this women’s record that Stacey helped me set! Ultra nerds, here’s more stuff to check out! Barry wrote a better recap about this race on his blog here. Elliot wrote about eating souls (running the 50k) here. 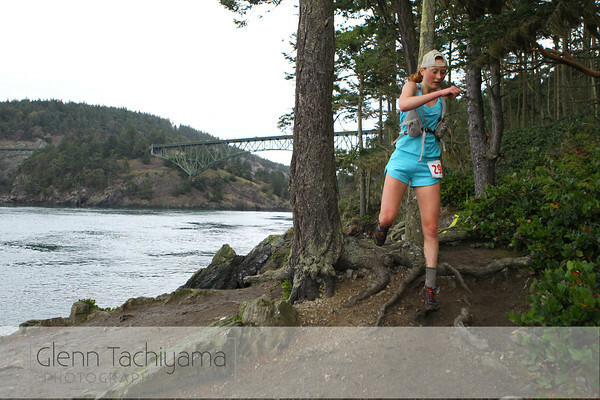 The amazing Rainshadow Running series of fun here. Race website here, there’s a 50k and a 25k.